ST. GEORGE – Municipalities in Southern Utah are facing a critical lack of money for road maintenance, and officials are hoping voters will approve a tax increase to solve the problem. City officials throughout Southern Utah are considering resolutions urging county leaders to put the optional sales tax for transportation funding on the ballot this November. The 0.25 percent general sales tax for transportation is the equivalent to one cent for every $4 spent and would fund critical local transportation needs including walking and biking trails, road improvements and public transit service expansion. Traditionally funded by fuel tax revenues, which have been dropping for decades, the shortfall has reached a critical point as cities and counties have been forced to dip further into their general funds to pay for road maintenance. 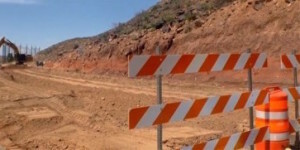 “It’s just simply something that cannot continue without it critically impacting the cities, their tax base, et cetera,” Ivins City Mayor Chris Hart said, adding that officials have only two options: letting roads fall into disrepair, or finding another funding source. Ivins officials are joining with other cities in the county, asking that the initiative be put on the ballot. Road maintenance was designed to be funded by fuel taxes, which the state collects, Hart said, then distributed to counties and cities according to how many miles of roads they have. Over the years, that source of funding has dropped significantly because of increasingly fuel-efficient vehicles and more vehicles using alternate fuels, such as hydrogen, electricity and compressed natural gas, which do not have a fuel tax. Both are positive developments, Hart said, but the unintended consequence has been that the number of fuel tax dollars has gone down, while the use of roads has increased. The Utah Legislature addressed the issue in the last session but lacked the political will to fully fund transportation needs, Hart said. Instead, the lawmakers came up with a hybrid solution that includes a statewide 5 cents per gallon increase in fuel tax and the ”local option,” which allows voters to authorize an additional quarter-cent sales tax increase for road maintenance needs. The state Legislature authorized the voter-approved local option in the Transportation Infrastructure Funding bill, denoted 6HB 362, earlier this year (see note under resources below). The measure will have to be placed on the ballot by the county, then approved by voters, much like the Recreation, Arts and Parks tax passed in Washington County in 2014. The need is so critical that some Utah counties have already been forced to let roads deteriorate into gravel, Hart said, but he doesn’t believe local residents want that to happen. While new taxes are always unpopular, cities and counties have no way to fund anything except through taxes, Hart said. Besides maintenance of traditional roads, cities are also responsible for the care of all the new trails, bike paths and other infrastructure required for the active lifestyle Southern Utah residents want and enjoy. Need for maintenance has expanded, and funding has shrunk. Even if the local option tax passes, the new funding along with the new state fuel tax will only cover about half of the anticipated road maintenance needs, Hart said. Cities will continue to have to fund road maintenance out of their general funds, but the shortfall won’t be as severe. It’s important to get new funding quickly, Hart said, because putting off road maintenance gets really expensive; when roads are allowed to deteriorate too much, it can cost five or ten times as much to rebuild them. The Transportation Infrastructure Funding bill authorizes the voter-approved local option. If approved by voters, the 0.25 percent general sales tax for transportation would fund local transportation needs. County legislative bodies must vote to put the question to voters on a ballot in a municipal or regular general election. 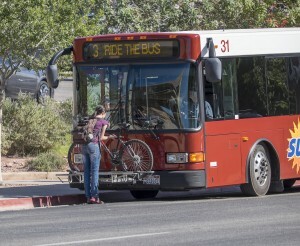 In areas without transit service, which include all of Washington County except St. George and Ivins, the funds would be allocated with 0.10 percent going to cities, towns and unincorporated county areas and 0.15 percent to the county. In areas with transit service, which includes St. George and Ivins, the funds would be allocated as follows: 0.10 percent to the transit provider, 0.10 percent to cities, towns and unincorporated county areas and 0.05 percent to the county. St. George operates the SunTran bus service, and so would be entitled to the 0.10 percent transit allocation, as would Ivins, although Ivins only has one route. The buses are operated and maintained by St. George, and the service is extended to Ivins through an interlocal agreement. Washington City also approved an interlocal agreement for SunTran in January 2015, but that service is not operational yet, and likely won’t be until sometime in 2016. Utah cities and counties have only one-third to one-half the transportation funds they need, according to a statement by the Utah Transportation Coalition, a group of business and civic leaders working to protect Utah’s environment, economy and quality of life through enhanced transportation investment. St. George officials plan to put the resolution on the City Council agenda in July, Public Works Director Cameron Cutler said, because the city faces the same situation. “If you’re having to pay for roads out of the general funds, you can’t pay for the other things you need,” Cutler said. Cutler’s department has had to postpone maintenance needs to stretch the budget. For example, the city is chip-sealing roads about every 11 years, rather than the recommended six to eight years. Chip-sealing is one of the most cost-effective ways to maintain a road, he said. If the local option sales tax passes, St. George would get additional funds for public transit and would be able to expand SunTran bus service coverage in the city. Currently, SunTran only covers about 50 percent of St. George, Cutler said. In Washington City, the City Council will consider a local-option tax resolution June 24. Transportation needs in the city include an east-west arterial road connecting the Washington Fields area with the new Mall Drive Bridge and development of an Interstate 15 interchange at milepost 11. Santa Clara passed its local-option tax resolution June 10, and projects in the city that need attention include North Town Drive between Rachel Drive and 400 East, Vineyard Drive and several other roads in need of repair. 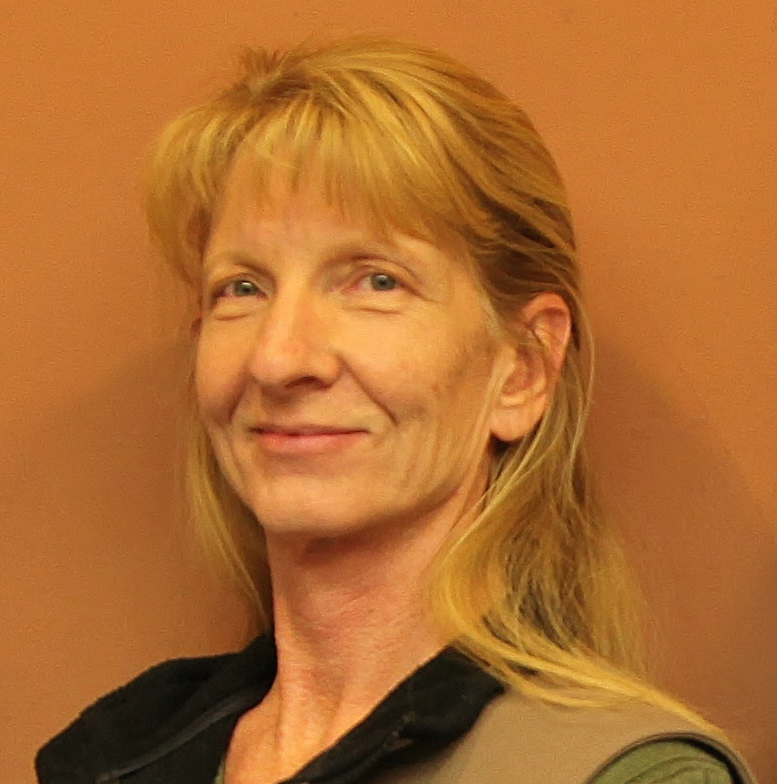 Toquerville passed its local resolution June 10 and has numerous transportation needs that will not be addressed this year due to budgeting issues. These include Hillside Drive and Cotton Gin Avenue, in addition to a backlog of projects including the resurfacing of most of the streets in the historic part of the city. Hurricane City voted down a local-option tax resolution in a City Council meeting June 4. Hildale is considering passing such a resolution. Note: The Transportation Infrastructure Funding bill, 6HB362, was brought during the 2015 General Session of the Utah Legislature. It passed the Senate 20-8, with 1 not voting; from Southern Utah, Sens. Ralph Okerlund, David Hinkins, Steve Urquhart and Evan Vickers all voted for the bill. It passed the House 44-29, with 2 not voting; from Southern Utah, Reps. Brad Last, John Westwood, Michael Noel, V. Lowry Snow, Don Ipson, and Merrill Nelson voted for the bill, and Rep. Jon Stanard voted against it. The bill was signed by the governor March 27 and the law is effective July 1. St. George (and governments at every level) don’t have a money problem. They have a principles / priorities problem. 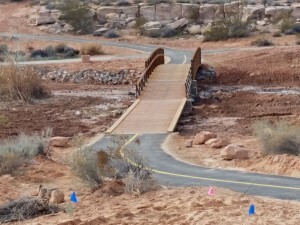 Case in point: St. George is building the “All Abilities Park”, basically a mini-Disneyland, complete with a train ride that has to be staffed and has liability issues, and yet they don’t have enough money for to fix the roads. Sounds like the person that has jet skis, atv’s, all sorts of consumer electronics, and two car payments in the driveway, but goes their church and asks for money for rent and food because they “just don’t have enough money”. No different, just bigger. Well the answer is NO. Let the roads go to waste, then at least people will wake up and fire you. NO NEW TAXES, NO MORE TAXES. Use the new cRAP tax to fix the roads if you have to, but don’t make up a new tax. Freaking morons. How many millions did they just spend on that new park with the stream running through it? How much was that Carousel? How much was that Electric Theatre? How much did they spend on the ‘stake out’ that busted those hardened criminal dancers at the Fiesta Fun Center? How much do they spend on all those shiny new cop cars? How much are they planning to collect with the new RAP tax? How much do they spend maintaining the planters in the middle of St. George Boulevard? How much does the city spend to subsidize the plethera of golf courses here that can’t turn a profit? I bet I could find the money needed to fix the roads…. By the way, St. George Code Enforcing Nazis- the ‘garage sale’ sign shown in the first frame at the top of this article is illegally placed. Find the owners of the illegal sign and fine them for it. That’s what St. George does, right? Go after the little guys? I say Vote It Down. For people who use the roads a lot, increase the vehicle registration fees based on their yearly mileage driven/ when purchasing replacement tires. (or) a extra .05 % sales tax applied at the car lot when they buy / register their shiny new Korean piece of crap they want to drive. (Bah humbug). (yes, we drive a tractor for a living and walk or use bikes when we’re out on a double date). Don’t increase the fees or taxes on anything. They have all the money they need, they just need to stop spending it on stupid things that are outside the proper role of government. The Us vs Them isn’t R vs D or right vs left. It’s politicians (and corporations and lobbyists) vs We the People. They love it when we fight each other because it takes the focus off their Kleptocracy. The LDS Church has very little direct influence on politics in the state (to the point that when they do get directly involved its a big deal, like with Prop 8 or the recent fair housing legislation). However, I fully acknowledge that peoples views and ideals are shaped by belonging to the Church, which in turn shapes their world-view and opinion. But the same can be said of any ideology we subscribe to, religious or not. Then why do they say in Utah the separation of church and state is about 3 blocks? I think that joke is well founded. versus borrow and spend democrats? So, let me see if I understand this correctly. Our cities are too poor to afford basic road maintenance, yet there is money enough in the till to renovate crumbling buildings, put up parks with splash pads in the midst of a severe drought, build a new police station when there was nothing wrong with the first, entertain thoughts of spending $50 million on a tiny pond, all while ensuring that our elected officials get their annual raise without fail. If the increased subsidy is so small for SunTran, then instead add that increase to fares. The time is nearing when it will be cheaper to give riders taxi service. “Putum up, Putum up”. I can hear them now. If your against raising taxes, you will certainly go to hell. Mormons don’t believe in hell. If we don’t have the money to fix the pot holes then why are we spending millions to widen other roads so that bicyclist and runners have their own lane? If the complaint is that the people using cars on the roads are the only ones paying the taxes then tax everyone using the roads equally not just through gas taxes. I don’t made sharing the roadway but everyone using it should pay equily for the privilege. Find a way to tax the bicyclists for their share of having to widen the roadways for them. Especially since my car isn’t allowed in their lane but they can leisurely ride 4 wide and block traffic on normal roadways. I shouldn’t have to pay for their life choices, they have had a free ride long enough. Get rid of Esplin would be a great start.